Posted By:Unknown | At:10:30 AM Be the first to comment! In honor of her life and contributions, Macy's is celebrating the legendary style icon, Eunice Johnson. Mrs. Johnson, who was the wife of the late John Johnson, patriarch of Johnson Publishing, launched the Ebony Fashion Fair in 1958. 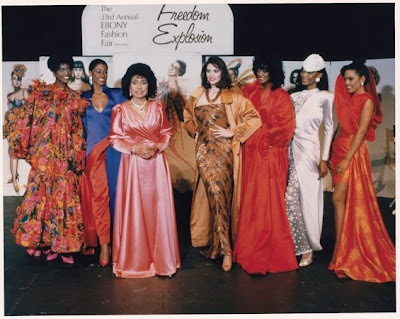 Back then; it was virtually unheard of for an African-American woman to run a business, let along rub shoulders with the European fashion elite. Today, the show still travels to 200 cities every year, and has raised millions of dollars for charity. Linda Johnson Rice is getting a look see as Macy's prepares for the upcoming exhibit honoring her mother's legacy. "My mother would have loved all this... really really thrilled," said Johnson. The exhibition is called "For the Love of Color" and honors Eunice Johnson and her vision behind Ebony Fashion Fair. The fair is said to be the world's largest traveling fashion show. "The really great thing about this is my mother really liked color, her vision and her style," continued Johnson. Mrs. Johnson's vision, which was unheard of when fashion started in 1958 -- was to showcase the best of the best couture clothing straight from Europe, and for the very first time featuring black models. Chicago is the second city of a 10-city tour that began in New York last week. The retrospective includes 15 haute couture outfits from a 7000 plus clothing archive from the runway. "We have... it's just an amazing collection of names you recognize immediately," said Jon Jones, the visual director for the fair. For "The Love of Color" opens this Wednesday on the 7th floor at Macy's on State Street. It runs through next Monday.